Want to hear something crazy? I wash my clothes with nuts. Yes, I do. Granted, these are not just any nuts. 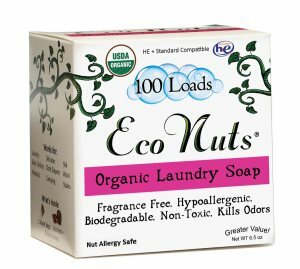 They are Eco Nuts Soap Nuts. Okay, they aren’t even actually nuts. They’re berries. Berries that grow in, and are wild-havested from, the Himalayas. When added to water, they naturally produce a soap called saponin. This soap is extremely mild, making it perfect for babies and people with sensitive skin but also strong enough for your average, everyday laundry. I was given a sample at last year’s Natural Products Expo and, let me tell you, it was one of my favorite products by far. I was BLOWN AWAY at how well they work. Free of all chemicals and artificial foaming agents, these are about as green of a product as one can get. Organic, fragrance free, hypoallergenic, biodegradable and non-toxic, they kill odors and will get your clothes CLEAN CLEAN CLEAN. They also act as a fabric softener and will keep color in your clothes better than any chemical agent. So go on. Order yourself a trial size and prepare to be AMAZED. wow a blog post. i just added this to my amazon wish list! looks cool. Fantastic information, many thanks to the author. It is complicated to me now, but in typical, the efficiency and significance is annoying. Very much thanks again and best of luck! This is nuts. Never thought that you could use nuts as laundry soap. I’ve really been seeing these more and more lately. I def need to get some and try them out.